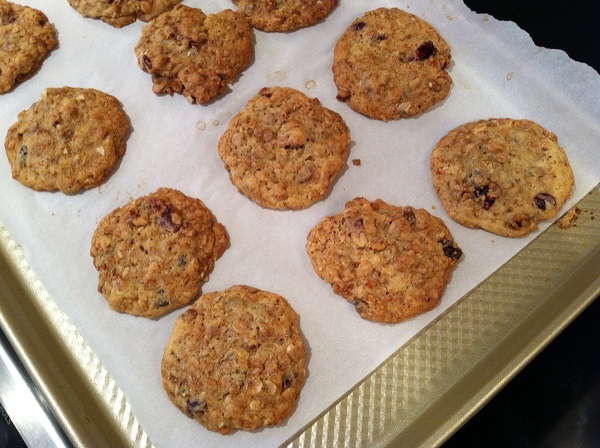 I got the recipe from the Beekman Boys, whom, as you may already know, I just love. 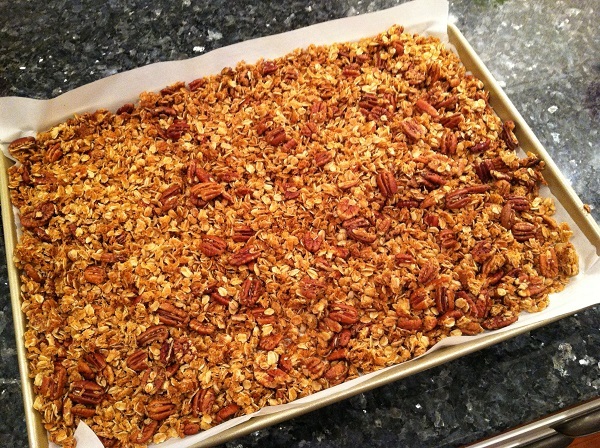 I love their recipes, their cookbooks, their home products, their Blaak Drizzle, their gardening, their goats…..
…..with a recipe I got here: Olive Oil and Maple Granola. It is a small-ish cookie recipe, making 24 cookies from my cookie scoop (which is similar to this one:Norpro Grip-EZ Stainless Scoop ). At first I thought the ingredient amounts were wrong since there is a whole stick of butter, only one egg and one cup of flour with three cups of granola added. But they turned out perfectly and disappeared very quickly at the shop. You MUST try them. You can use store-bought granola, BUT I’m telling you, this homemade stuff is to. die. for. And really, so, so, so easy. A little tip: don’t skip the step of adding salt to your granola. It totally adds to the whole flavor profile (said like she’s a professional cook-er or something…). Sausage, Potato and Kale Soup since I’m on a kale-in-my-smoothies kick and have a whole lot of kale-in-a-bag. Beef Burrito Casserole since it just looks so cheesy, beefy, taco-y good. Tyler Florence’s Chicken and Dumplings since it is so cold and this is just the right thing for that. I make this recipe all the time but use stock-in-a-box and chicken breasts, instead of cooking a whole chicken and making stock from the bones, because who has a million hours to do that? It still comes out great. Posted in Uncategorized and tagged beef burrito casserole, chicken and dumplings, cowboy cookies. beekman 1802, sausage potato and kale soup, the spinning room on January 10, 2015 by lizytish. I’m definitely going to try the Beef Burrito Casserole. And I am SO relieved to know that you don’t actually cook the whole chicken and make the stock for the chicken and dumplings recipe! I looked it up after you told me about it but feel like it would be one of those recipes that takes up and entire weekend day. Thus, it hasn’t been tried yet. But now I will try it with stock-in-a-box and chicken breasts. Yes – I can’t imagine that it would taste MILES better to make it worth doing all that! Let me know how you like them!